What are your children doing this summer? 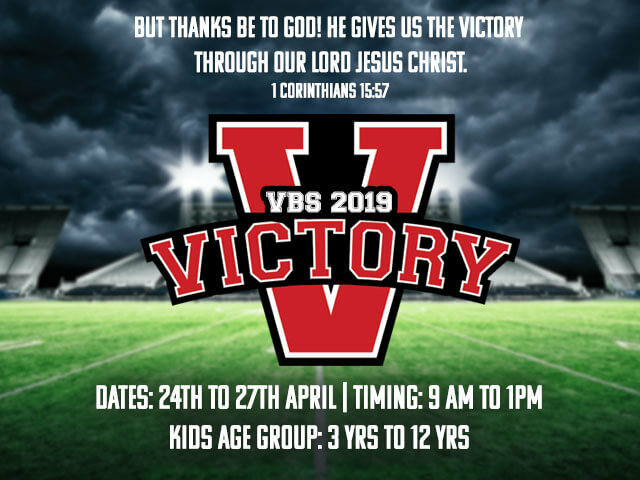 VBS 2019 is right around the corner, beginning April 24th through April 27th. This is the perfect opportunity for children in the age group 3 – 12 years to socialize and discover the Bible in a relaxed setting. While the line-up of themed activities are centered around teaching them about God, VBS combines fun and learning without the formality of a Sunday service. The best part, you don’t need to be a Church member to enroll and Registrations are FREE!. Don’t miss out on this unparalleled opportunity. Enroll today! 3) Snacks will be provided for children each day. 4) Parents can drop the children at the registration counters and pick them up at 12:30 pm once the day’s program is over. 5) On the last day, there will be outdoor games organized for kids from 6 to 12 yrs. Age 3-5-year-old kids will play indoor games. 6) The skit, craft and activities will be based on Holy Bible teachings. We would also take a few minutes to pray for children each day.